A chocolate brain oozing with marshmallow cream is just what kids will love for a gruesome party of fun and horror. I'm not overly fond of the idea of sinking my teeth into a an oozing brain. But, when it's an oozing chocolate marshmallow brain, I'm willing to make an exception! Won't your kids be amazed at this horribly delicious Halloween treat? It's really not difficult at all to make. You need to give it a try. 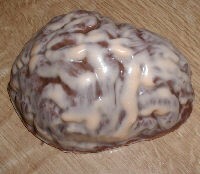 Pick up the chocolate brain mold at One Stop Candle. It's only a couple of dollars. You can get your peach (or white) and milk chocolate and even the marshmallow Cremeco filling there, too, if you like. That's really all you need besides a clean paint brush! Melt the peach chocolate melts in the microwave. Heat in 30 second intervals, stirring every time, until smooth. The peach melts look more brain like, but you can use white if you like. (You can also use a double boiler if you prefer). 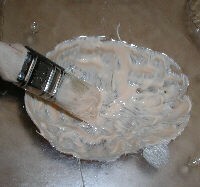 Paint the mold with the peach melts, leaving it thin in some areas and thicker in others. Allow it to set before continuing. Melt the milk chocolate and brush a layer over the peach. Again, allow it to set. Repeat until you have a shell about 1/4 inch thick. Use a prepared marshmallow filling or make your own by combining 6 Tbs. margin, 1 cup powdered sugar, and 1 cup of marshmallow cream. You can add a few drops of red food coloring to make it more effectively gruesome. Pour the filling into the brain mold until almost full, but leave about 1/8 inch of room for the final layer of chocolate. Fill the rest of the mold with chocolate and tap gently to even it out. Refrigerate to set and then freeze for several minutes to help it release from the mold easily. Serve your yummy chocolate brain on a platter with perhaps some peanut butter eyeballs or chocolate body part candies. You can make Halloween chocolates in all different shapes. You can get skull molds, pumpkins, cats, ghosts, candy corn, eyeballs, and more. There are lollipop molds, chocolate covered pretzel molds, and even chocolate covered cookie molds. These are simple but effective Halloween party favors for school, work, or parties. Everyone loves them! Have A Halloween Recipe Or Gift Idea? Do you have an Halloween recipe or gift idea that you picked up somewhere along the way? Share it with the rest of us! If you've actually made it, go ahead and show off. We'd love to see your work.